File photo of an "ugly" tomato — bruised but still edible! One man's trash is another man's produce — that other man being University of Maryland alum Ben Simon. His company, Imperfect Produce, doesn't just save "ugly" food from the trash. It turns the fruits and veggies into Instagramable products people can order in a trendy, customized box delivery service. That trendy marketing has resulted in more than 35 million pounds of produce recovered, according to the company. Imperfect Produce's newest hub for odd-but-edible produce packing is in Severn. The company has five other pack centers serving 10 major cities — San Francisco, Los Angeles, Portland, Seattle, San Diego, Chicago, Milwaukee, Indianapolis, Austin and San Antonio. The Anne Arundel location opened last week, making service available as far as Baltimore and Tacoma Park. Soon, Simon says 35 employees will grow to 200 or 300 to serve "the entire DMV." The team inspects the food to make sure it's only cosmetically unusual, not bruised or bad. Then it is repacked into boxes, weighed and crated the morning before it's delivered. "We're able to rescue a lot of product that would otherwise get tilled into the soil," said Nate Sumner, director of quality control. The opening of the company's newest location comes at a crucial time for food banks and other organizations trying to feed for the hungry. Imperfect Produce has partnered with the Maryland Food Bank and surplus produce goes directly to the organization, the company says. On Giving Tuesday, Imperfect Produce hosted a fundraiser for the food bank and matched every dollar donated up to $1,000 in produce. Last Tuesday, the second day of operations, Sumner stood with Simon and the company's team of directors donned in hair and beard nets, wearing winter coats in the refrigerated packing area. Sumner picks up a pear with an S-shaped scar, sitting next to a carrot that looks like it's giving a thumbs up and equally sized brussel sprouts and avocados. "This is no different than any other pear on the inside," he says. Sumner was a farmer for 10 years outside of Chicago. He's tired of seeing perfectly good food go to waste. "It took the farmer just as much work and just as much energy to grow this one. We don't value it differently." The concept was initially a project from the University of Maryland's Food Recovery Network, which Simon started in 2011 to fight hunger with leftover campus meals. "I had been working at the farmers market in D.C. since I was a teenager, and it was scary to see how much good food got thrown out," Simon said. "So we saved some and started selling 10-pound boxes for $10." The darkest time of the year can also be the most dazzling. 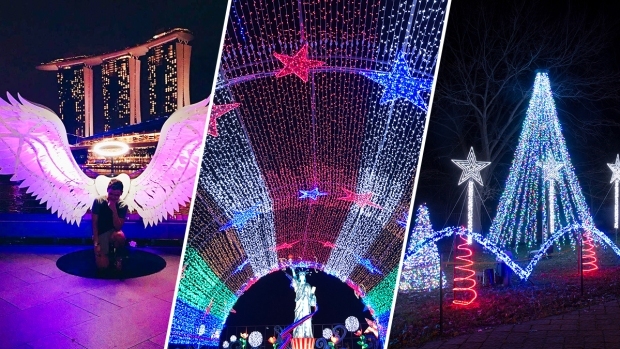 Check out these bright displays of holiday lights from all around the D.C. area. The pricing is a bit different now. Organic boxes range from about $15 for 7 pounds to $43 for 25 pounds, and conventional boxes range from about $11 for 7 pounds to $27 for 25 pounds. You're still paying about $1 to $1.75 a pound, before the $4.99 delivery fee. But that's the cost of ugly.